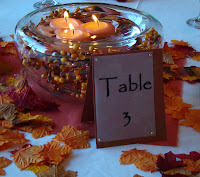 Fall was the theme of yesterday’s wedding in Genesee. The weather was perfect for an outdoor evening wedding ceremony. The bride is such a sweetheart. I really enjoyed working with her in the past month. The guests had a great time, the food and catering staff were amazing and the DJ had the dance floor packed until the very end.